1. 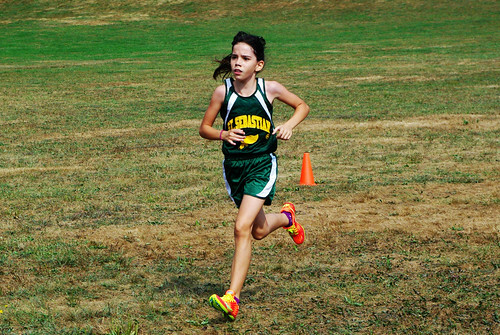 Saturday was Rosie's first cross country meet of the season. She did very well. All of her running this summer with her brother's team really paid off. She came in 6th place for the 5th and 6th grade girl's race with a time of 11:11 for 1 1/2 miles. 2. Rosie is a lot like me. She was so worried about her meet that she made herself nauseous. That is sooo much like me! The week before my wedding I could not move my neck. At all. That's why I look a little stiff in my wedding photos. It wasn't until the last ten years or so that I've learned to calm myself down and not let anxiety become visceral. So on the way to the race I taught her how to do slow her breathing down; she said that helped a little bit. This is something I'm going to have to keep an eye on! I suffered through my school years and part of my adulthood with this type of anxiety and I would like to spare her if possible. 3. We will be starting our official school next week, although I don't intend to be fully into it until after Labor Day. That all said, we did start chemistry this week and have to have all of chapter 1 read before Wednesday. We also have to have two chapters of economics read. before co-op on Wednesday as well. This is the first time in eight years that I have NOT had a math tutor. This was not by choice. Both of my tutors moved away. But I'm not overly worried about it because I switched over to the Math U See courses. We had good luck with their Geometry program last year so I decided to take a chance with their Algebra 2 and Pre-Calc. From their samples the instruction seems to be pretty straightforward. 4. Our investment house is coming along. 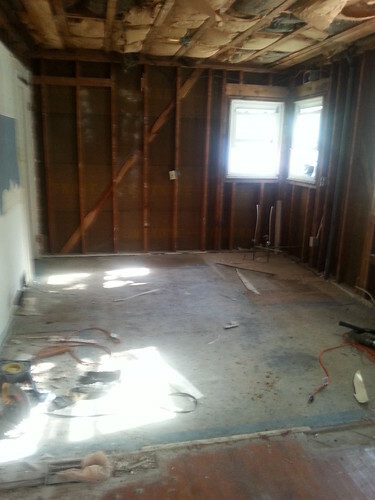 We have two replacement windows in, and all of the stuff that needed to be demolished and removed is gone. 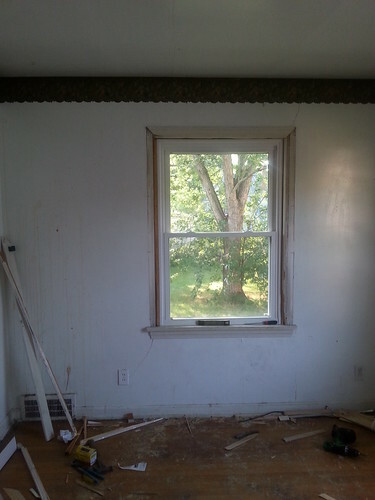 Here's a quick peek at the windows and the kitchen to date. 5. I used to be an active Jazzerciser, attending class four of five times a week. I really loved it. But when I became pregnant with Rosie I stopped due to time and expense and then I became an avid exerciser in my own basement with tapes and DVDs. A few weeks ago a friend of mine who used to be a Jazzercise instructor called me up. She was moving across the country and she offered to give me all of her instructional videos and DVDs that she had managed to collect over the past 20 some years!! I was thrilled!! Most of these are VHS tapes but I have so many good memories with many of these routines, so it is certainly worth it to me to have them. 6. I have been binge watching Grey's Anatomy over the past few weeks. I hadn't watched it at all for about two seasons, but when I heard Derek died I decided that I had to catch up. This scene between Derek's sister and her boyfriend really resonated with me about what grief feels like and what it is like to move through and past it. 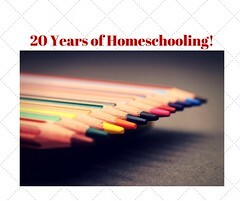 This year will be my 20th year of homeschooling. I thought it might be nice to share a memory or two each week of our homeschooling adventure. When we first joined our local Catholic Homeschool Group, many of the women had been homeschooling for a couple of years already, and most had been friends way before that! So I felt a little intimidated to be among such a seasoned group of home educators and their children. Yet I was determined to fit in with this group and to try and glean as much wisdom and information as I could. I also wanted my children to make friends with these other homeschooled children so that they would feel welcome and a part of the group too. Part of my strategy for accomplishing these goals was to attend every possible field trip that was offered. One of our early field trips was a visit to a nearby planetarium. As my husband was at work, (my husband was ALWAYS at work) I took my boys, ages 6, 2 and 6 month old to the planetarium by myself. I don't remember much of the show. I think it was about ancient skies and the movement of the stars and planets. I was probably trying to keep my fidgety boys under control for the entire program. When it was over there was time for questions. I remember being so impressed by the intelligent questions that the older boys and girls were asking. It was clear that many of these students had already studied the solar system! Then my brave six-year-old, raised his hand for a question and I was a little apprehensive about what he would ask. After all, we had just started kindergarten and hadn't done a thing with the solar system yet! When he was called on he clearly asked, "Which one is the wishing star?" I felt my face get hot and red. The grad student giving the presentation stammered a little bit and didn't really have a good answer about the wishing star. I don't think he was ready for that type of question. At the time I remember feeling embarrassed, but now that I look back on it, that was a wonderful question for a little boy to ask! I wish that I could have enjoyed that moment more.